We live in an era where we would like to have access to our work anytime and anywhere. The work can be of a lot importance. When the reign of internet started people would run around for all the programs and downloads. As time passed by, internet advanced and everything eventually moved on to the cloud. Everything has now moved on to cloud. Imagine you are updating a status on Facebook, it is all because of cloud. Checking your bank balance you are again using cloud to do that. It has so become that we have started to rely on the cloud even for our small businesses. Cloud would help you in solving all the small and the big problems that you would be facing. Cloud has been that rapid growth in technology. One question that most of us have is, why are most of the businesses are moving to cloud? It is due to the increased efficiency and smooth cash flows and many more benefits that will adhere to the business. Cloud services are ideal for the businesses whose bandwidth keeps on fluctuating. At a point if your needs increase the cloud capacity can also be increased. Likewise, after a point if the needs decrease then the capacity can be made flexible. This type of agility that the business can have is an advantage over the businesses. There’s no surprise that this would be one of the reasons for your business being moved to cloud. Businesses of all the sizes need to have a robust disaster recovery, but it may happen that small businesses may not be able to afford the expertise. But still small companies are likely to implement these recovery solutions to save time and avoid the large investment in the later phases. The beauty of cloud is that the servers are off premise and you need not take care of anything. It’s the duties of the suppliers to take care of them. They are the ones who would regularly roll out the software as well as the security updates. You need not worry about anything but only focus on the growth of your business. The cost that is there on hardware is reduced a lot. You only need to pay on the subscription that you are using. This will ease you out and suddenly that big scary project starts looking easy. Managing and sharing documents with the team can be a tedious task. Cloud has made this easy the teams can share documents anytime, from anywhere so the output can be more. The updates can be done in real time and gives a clear visibility of the collaborations. Cloud has given that flexibility that you can work from anywhere you want with just an internet connection. There are no restrictions as now you can use the handheld devices to do your work. The ultimate result for this is that you can give your employees flexible working hours that will help to give a perfect work-life balance for them. This flexibility can prove to be a boon for the company. There are many employees that would be collaborating on the documents, greater the demand the more you need to control the documents. Before cloud came in documents were sent as attachment and only one person could work at a time on the document which generally ended up in a mess. Once the company goes global and uses this legacy method the complications arise. The advantage of moving to cloud is that all the files are located centrally and the access can be given to particular people. You can take example of Google Docs where you can share the documents with others and grant them permissions for editing or only reading. It may so happen that you lose your laptop. Losing on the laptop means losing on to a lot of data. This is where cloud comes in. Cloud gives a great security. If you lose your laptop it’s ok because all your documents will be stored on the cloud and you can get them back. You can even delete data permanently that is not required. Moving to cloud will give you a faster access. The smaller companies have a higher impact than the established ones. One should use the Pay-as-you-go service and the cloud business applications so that the small scenes can be run and disrupt the market by remaining lean and nimble. The above points are beneficial for your business. When the clouds need some fluctuation, the capacity of the server is scaled up or down to fit accordingly. So one will use the capacity required. It should be a friendly system for all working on it. 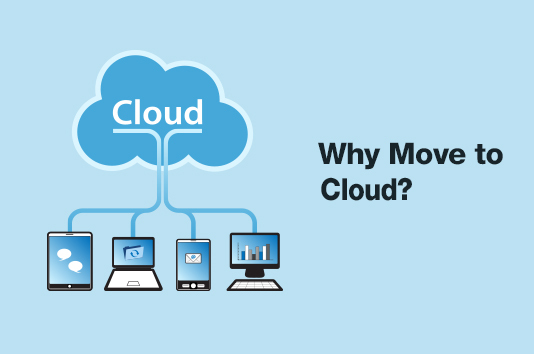 One can give you more and more reasons for moving to cloud. You need reasons and solutions? We at Inspirria Cloudtech are here to help you. You can take us as your secured cloud provider partner and ERP solutions with decade plus of experience working with 450+ Cloud projects. Push productivity to its optimum level with proven solutions, which is used by the best companies all over the world.